On 7th June 2016 another important step was taken towards decarbonising the South Australian economy. Solastor Australia announced detailed plans to build a solar thermal power station at Port Augusta. Years passed and despite the enormous enthusiasm of the people of Port Augusta, and tireless activism, little physical progress was made. After a long study, Alinta Energy announced in September 2015 that it wasn’t feasible for it to build a solar thermal plant to replace its coal-fired power stations. Closure had been expected some time between March 2016 and March 2018, but the end came quickly with the power stations shut down on May 9th 2016. South Australia lost a significant part of its baseload power-generating capacity without any commencement of building a replacement. But despite that, the transition to a green economy is well underway in South Australia. 41% of the State’s electricity grid generation was powered by renewable energy in 2014/15. And the South Australian Low Carbon Economy Experts Panel reported to the South Australian Government in November 2015 that it is feasible for the State to reach net zero emissions by 2050. So this week’s announcement from Solastor Australia is tremendously important, particularly because the company is promising prompt action. They plan to build a grid-connected pilot plant at Port Augusta by the end of 2016, using scalable technology. The 1MW demonstration solar thermal power station will have several collector towers, each holding a 10 tonne block of graphite that can store the heat from the toroidal reflector mirrors for up to a week. Water circulating through tubing embedded in the graphite is converted to steam which then drives a turbine generator. The full-scale grid-connected power station will have 1,700 collector tower modules and is expected to generate 110MW in winter and 170MW in summer. 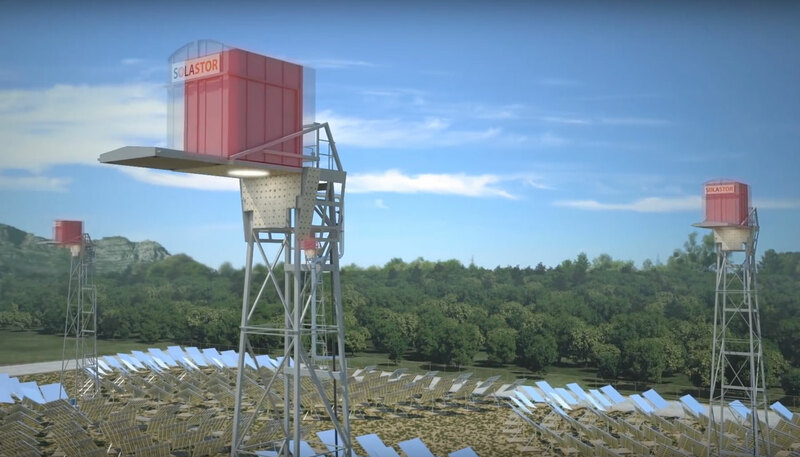 Solastor envisages that this will be the first of many similar baseload solar thermal plants. You can watch the Solastor Australia launch video on YouTube or on the New Internationalist Australia Facebook page. This entry was posted in Activism, Climate change, Environment, Renewable Energy, Technology and tagged activism, climate change, coal, environment, Port Augusta Solar Thermal, renewable energy, Repower Port Augusta, solar power, sustainability by Brian Loffler. Bookmark the permalink.